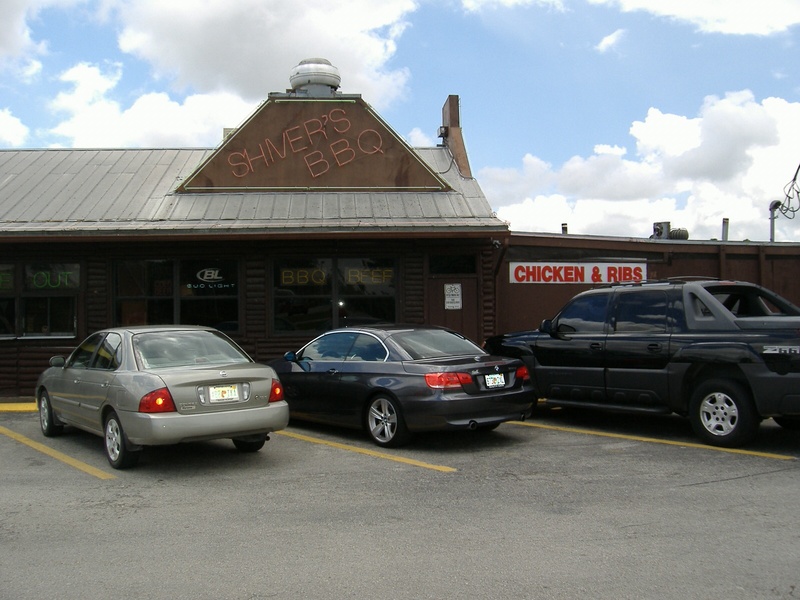 ***** Shiver’s BBQ, 28001 South Dixie Highway, Homestead, Florida 33033, (305) 248-2272. Let’s play Southerner…got a great bbq joint for you, Shiver’s BBQ in Homestead. Shiver’s has been around for something like 50 years. Just so you know, we are talking “smoked goods” here—so, if the sweet sauces of Tony Roma’s or Bobby Rubino’s are your game–come prepared! Personally, I’m not a huge smoked-fan…but Shiver’s like the Three Pigs, has the formula for Just Right. You can check menu/prices at www.shiversbbq.com. Shiver’s got a cute idea going…you eat at long picnic tables which line the joint. So in theory, you “could” be eating with strangers. Over the years, I’ve seen this seating thing done at other joints—Shorty’s B-B-Q in Miami (9200 South Dixie Highway) which has been around since 1951, has a similar setup (see review 7/10/08)…I also remember eating in a few Amish joints in Lancaster, Pennsylvania—they had “group” seating, but also had family style portions—but that’s a whole ‘nother story. A recent outing had me doing…corn nuggets, macaroni & cheese, cornbread souffle, french fries, babyback ribs, bbq chicken, pulled pork. Let me make this real-simple…Shiver’s BBQ is right-up there with the best bbq joints that- this originally from Brooklyn boy has ever eaten in. Everything was outrageously delicious. Shiver’s BBQ is open Sunday-Thursday 11am-9pm and Friday-Saturday 11am-10pm. 1 comment avg on your last 10 restaurant reviews. Don’t think you should be so quick to judge people who work so hard to make a living. I’m sure their batting avg. is far better than yours. Obviously you do this to write off all of this unhealthy food you eat and probably don’t care about any interest in your blog. Give it up, you are sooooo boring and predictable. No question here Shiver’s has great food. Been eating there for the past 15 years and nver had a bad meal. Their pulled pork is the best that I’ve ever had. This is a landmark here in Homestead!!! !